WASHINGTON COUNTY — Every Tuesday inside Purgatory Correctional Facility a special class titled “Inside Out Dad” takes place. It is a program aimed at teaching incarcerated dads how to be better fathers and one that has the potential to positively change the lives of both the inmates and their families. Information from the National Fatherhood Initiative — creators of the Inside Out Dad program — said that father absence has created what they call a “father factor” that can be seen in nearly all of the societal ills facing America today. It is the mission of the National Fatherhood Initiative to equip organizations and communities with the knowledge and ability to proactively promote the engagement of fathers in their children’s lives. That includes incarcerated fathers. The Inside Out Dad program Kendall teaches in Purgatory Correctional Facility is an evidence-based program. It is made possible by a nearly $8 million fatherhood education grant awarded to Utah State University by the U.S. Department of Health and Human Services’ Office of Family Assistance. 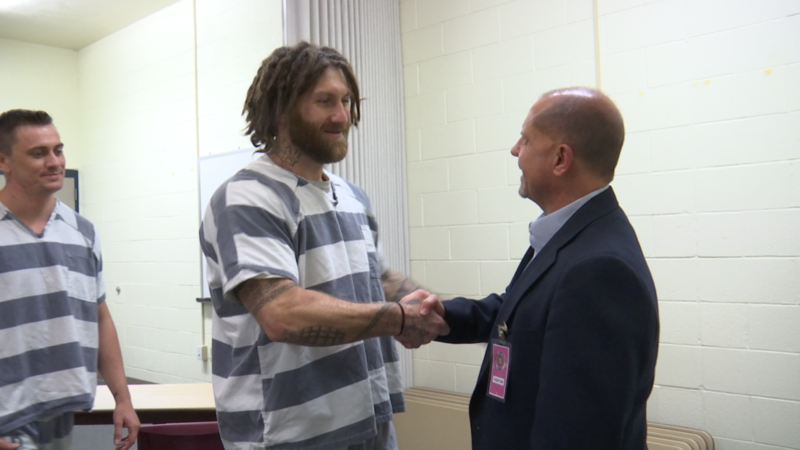 It is programs like the Inside Out Dad class that help reprogram the way the inmates think and behave, which hopefully sets them on a path to be reunited with their children and keep them from returning to jail. My dad was not an inmate but a successful Vice President of a company and he was a terrible dad in that he wasn’t present or interractive. He paid child support and stuff but that didn’t help me lol. Good for these fathers getting some ideas of how to be a better dad. This is a great story about dads taking the time to focus on being better people. Great job to all involved.